Rebellion has zinged the Australian government for refusing a classification for the upcoming FPS Aliens vs. Predator, saying it's "disappointed" by the decision but won't release a censored version for the Australian market. Australia's Classification Board is at it again, deciding yesterday that Aliens vs. Predator, due out in 2010, was too graphically violent for gamers Down Under. The board objected to the "explicit decapitation and dismemberment, as well as locational damage such as stabbing through the chest, throat, mouth or eyes." The board paid particular attention to the Predator, which "can stab a character through both eyes with its wrist blade, and then rip off their head, with spinal column still attached." In response, Rebellion CEO Jason Kingsley issued a statement defending the game and chiding the Australian government for treating adult gamers like children. 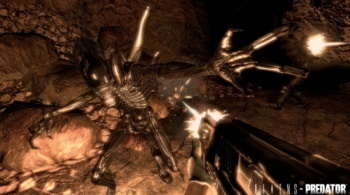 "Rebellion is disappointed that its upcoming title Aliens vs. Predator has been banned in Australia," he said. "However, as we understand the law in that country the authorities had no choice as we agree strongly that our game is not suitable for game players who are not adults." "The content of AvP is based on some of the most innovative and iconic horror movies, and as such we wanted to create a title that was true to the source material," he continued. "It is for adults, and it is bloody and frightening, that was our intent. We will not be releasing a sanitized or cut down version for territories where adults are not considered by their governments to be able to make their own entertainment choices." Is it just me or has 2009 been kind of a rough year for Australian gamers? Left 4 Dead 2, Risen, Necrovision, CrimeCraft, F.E.A.R. 2 (which was late 2008, yes, but close enough), Michael Atkinson's threatened appeal of the MA15+ rating for Modern Warfare 2 and now this: It seems to me like the anti-gaming forces are really on a roll. It's also interesting to note that on the same day the Classification Board refused a classification for Aliens vs. Predator, it gave the thumbs-up to POV Juggf*ckers 2.